Iannis Xenakis (Greek: Γιάννης (Ιάννης) Ξενάκης ; 29 May 1922 – 4 February 2001) was a Greek-French composer, music theorist, and architect-engineer. After 1947, he fled Greece, becoming a naturalized citizen of France. He is commonly recognized as one of the most important post-war avant-garde composers. Xenakis pioneered the use of mathematical models in music such as applications of set theory, stochastic processes and game theory and was also an important influence on the development of electronic and computer music. He integrated music with architecture, designing music for pre-existing spaces, and designing spaces to be integrated with specific music compositions and performances. Xenakis was born in Brăila, Romania. He was the eldest son of Klearchos Xenakis, a Greek businessman from Euboea, and Fotini Pavlou from Lemnos. His parents were both interested in music, and it was Fotini who introduced the young Xenakis to music. Her early death, when Xenakis was five years old, was a traumatic experience that, in his own words, "deeply scarred" the future composer. He was subsequently educated by a series of governesses, and then, in 1932, sent to a boarding school on the Aegean island of Spetsai, Greece. He sang at the school's boys' choir, where the repertoire included works by Palestrina, and Mozart's Requiem, which Xenakis memorized in its entirety. It was also at the Spetsai school that Xenakis studied notation and solfège, and became enamoured with Greek traditional and sacred music. In 1938, after graduating from the Spetsai school, Xenakis moved to Athens to prepare for entrance exams at the National Technical University of Athens. Although he intended to study architecture and engineering, he also took lessons in harmony and counterpoint with Aristotelis Koundouroff. In 1940 he successfully passed the exams, but his studies were cut short by the Greco-Italian War, which began with the Italian invasion on 28 October 1940. Although Greece eventually won the war, it was not long before the German army joined the Italians in the Battle of Greece, in April 1941. This led to the Axis occupation of Greece during World War II, which lasted until late 1944, when the Allies began their drive across Europe, forcing the Axis forces to withdraw. Xenakis joined the National Liberation Front early during the war, participating in mass protests and demonstrations, and later becoming part of armed resistance—this last step was a painful experience Xenakis refused to discuss until much later in life. After the Axis forces left, Churchill ordered that British forces step in to help restore the Greek monarchy; they were opposed by the Democratic Army of Greece, and the country plunged into a civil war. In December 1944, during the period of Churchill's martial law, Xenakis (who was by then a member of the communist students' company of the left-wing Lord Byron faction of ELAS) became involved in street fighting against British tanks. He was gravely wounded when a shell hit his face; that Xenakis survived the injury has been described as a miracle. He survived seriously scarred, and lost his left eye. In 1953 Xenakis married Pierre Schaeffer and Pierre Henry, dedicated to studying and producing electronic music of the musique concrète variety. Shortly after that Xenakis met conductor Hermann Scherchen, who was immediately impressed by the score of Metastaseis and offered his support. Although Scherchen did not premiere that particular work, he did give performances of later pieces by Xenakis, and the relationship between the conductor and the composer was of vital importance for the latter. 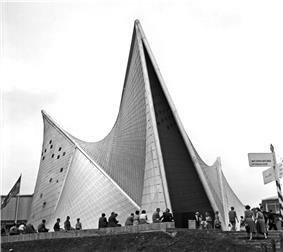 By the late 1950s Xenakis slowly started gaining recognition in artistic circles. In 1957 he received his first composition award, from the European Cultural Foundation, and in 1958 the first official commission came through, from Service de Recherche of Radio-France. In the same year he produced a musique concrète piece, Concret PH, for the Philips Pavilion, and in 1960 Xenakis was well-known enough to receive a commission from UNESCO, for a soundtrack for a documentary film by Enrico Fulchignoni. Xenakis was an atheist. According to Zbigniew Skowron, "In accordance with his atheist views, Xenakis emphasizes the finality of death as the ultimate event of human life, and this is probably why wild shrieks and moans punctuate his score". Xenakis wrote, "Man is one, indivisible, and total. He thinks with his belly and feels with his mind. I would like to propose what, to my mind, covers the term "music": ... 7. It is a mystical (but atheistic) asceticism ...". By 1979, he had devised a computer system called Mycenae-Alpha was the first of these pieces he created using UPIC as it was being perfected. ^ Hoffmann, Grove: "[Xenakis] belongs to the pioneering generation of composers who revolutionized 20th-century music after World War II." ^ MSN Encarta encyclopedia, "Iannis Xenakis (Ιάννης Ξενάκης) (May 29, 1922 – February 4, 2001) was a Greek composer and one of the most important modernist composers of the 20th century" . Archived 31 October 2009. ^ a b Varga 1996, 14. ^ Gilbert, Martin. 1966. Winston Churchill, 56. Oxford University Press. ^ a b c Hoffmann, Grove. ^ Xenakis, Brown, Rahn 1987, 20. ^ For a study of Messiaen's teaching methods, see: Boivin, Jean (1995). La Classe de Messiaen. Paris: Christian Bourgois. ^ Xenakis, Françoise; Waldburg-Wolfegg, Andreas; Green, Sarah; Elliott, Maro. "Mme Xenakis in Conversation". International Contemporary Ensemble. Retrieved 20 September 2009. ^ Cole, Jonathan. "Music and Architecture: Confronting the Boundaries between Space and Sound". Gresham College. Retrieved 21 September 2009. ^ Zbigniew Skowron, ed. (2001). Lutoslawski Studies. Oxford University Press. pp. 122–123. ^ Iannis Xenakis (1992). Formalized Music: Thought and Mathematics in Composition (2 ed.). Pendragon Press. p. 181. ^ Griffiths, Paul (5 February 2001). "Iannis Xenakis, Composer Who Built Music on Mathematics, Is Dead at 78". The New York Times. p. 7, section B. Retrieved 13 September 2009. ^ Di Scipio 1998, 201. ^ Hugill, Andrew. The Digital Musician, New York: Routledge, 2008, pp. 95, 182. ^ Di Scipio 1998, p. 220. Biasi, Salvatore di. 1994. Musica e matematica negli anni 50–60: Iannis Xenakis. Bologne. Università degli Studi di Bologna. Clark, Philip: "The Wire Primers: A Guide To Modern Music" Xenakis, pages 191–198; Verso, 2009; ISBN 978-1-84467-427-5. Mâche, François-Bernard. 2002. 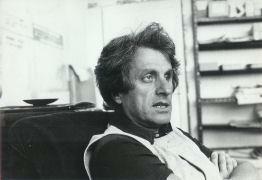 Portrait(s) de Iannis Xenakis Seuil. ISBN 2-7177-2178-9. Paland, Ralph / von Blumröder, Christoph (Ed.). 2009. Iannis Xenakis: Das elektroakustische Werk. Internationales Symposion. Tagungsbericht 2006. (Signale aus Köln. Beiträge zur Musik der Zeit, Volume 14) Wien. Der Apfel. ISBN 978-3-85450-414-6.